It took a lot of research before it was confirmed by a Department of Fisheries official that my dad knows and in fact there’s 28 species of prawns being reared/caught in Sarawak but the two major ones are Macrobrachium rosenbergii (big head prawn) and Litopenaeus vannamei (this one is mostly for export as apparently locals here don’t like it but it’s prized in the US and Australia). It’s all quite interesting, I must write about it in detail someday, what I thought was two different species (and at one point I thought they were langoustines) are actually just different stages of maturation which is why some have orange claws and some blue claws. 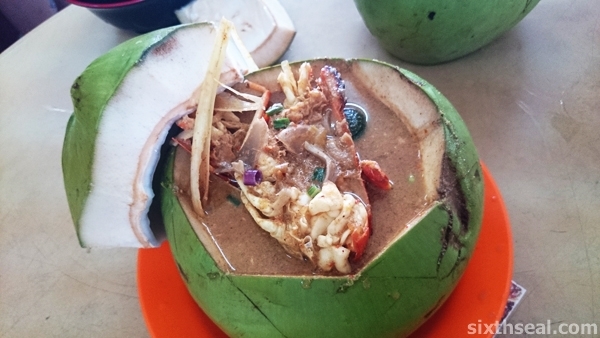 I’ve always liked Glory Cafe’s asam tom yam big prawn noodles and this new recipe inside a coconut and made with coconut juice is very good (and new too – according to the owner, it was introduced late last year) – the ones in the coconut tastes different from the ones in a bowl. i know sarikei is famous for its gigantic pineapple statue..didn’t know there’s tom yam too! This place is very famous, was the first one to write about it (to the best of my knowledge – don’t know about Chinese language food forums) and I know they printed out my blog post and put it there coz they said a lot of people came after me and were blogging about it too. It’s a small community, Sarikei. I love it dear…Thanks for driving us to the little town for this yummylicious tom yam noodles. 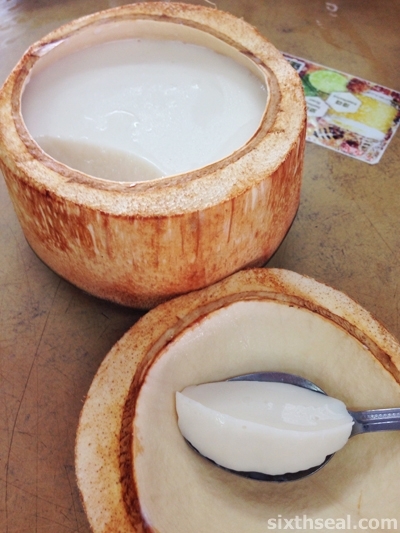 I also love the coconut pudding, a very refreshing dessert. I remember to bring it back your house but forgotten to eat and glad you remember to finish it. I did say that I was going to bring you to Glory Cafe in Sarikei back when my mom was still alive (the previous time you came to Sibu with me, not the time you came for my mom’s funeral) and we went to Min Kwong Cafe for the expensive RM 35 fish and big prawn noodles. 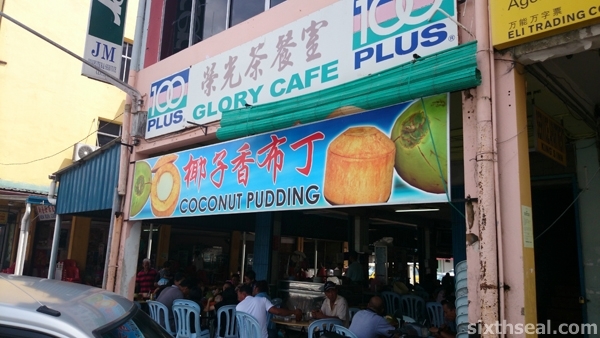 Oh ya, the coconut pudding, they are promoting it so well that every table has one! It’s homemade so I’m surprised it didn’t spoil after three days – didn’t remember to eat the leftover until I saw it in the fridge one night. My dad also enjoyed the road trip very much – so funny the last photo, I think he was annoyed coz the Indonesian waitress asked him to move closer so he had to lift up his chair for the photo. Haha! You and your dear having same smile lah. Oh that’s great! 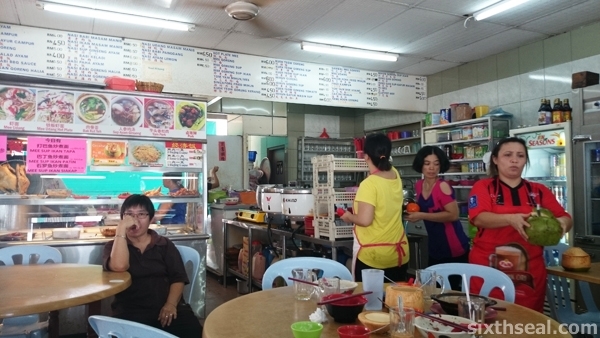 I’m a huge fan of big prawn noodles, I will go and try it in Teluk Gong. I wonder what kind of prawns they use in Peninsula Malaysia, it might not be the same. I guess it could be Litopenaeus vannamei (what we call big white prawn and it’s reared/caught mostly for export outside Sarawak coz it’s not popular here but there are some sold here too, it’s just not as coveted) which *DOESN’T* have claws – the ones in the picture is more famous in Sarawak and a Department of Fisheries guy told me about it. Macrobrachium rosenbergii can have no claws, orange claws or blue claws depending on maturity. That’s the big head prawn that we Sarawakians like and use in our noodles – you can also eat the meat from the antenna/claws coz it’s the size of a pencil, that’s how large it is! Woohoo …look at the big prawn!! And in a coconut shell ? I am sure it will enhanced the taste of the tom yum. Anyway it doesn’t come cheap though at Rm33. Looks So Yummy !! You can eat the meat from the claws too, at one point I thought these are langoustines but it’s not (although to my surprise we do have langoustines too, it’s just not that many compared to these two major species that we rear/catch). Yeah, it’s the prawns that makes it expensive, this is a high demand species. 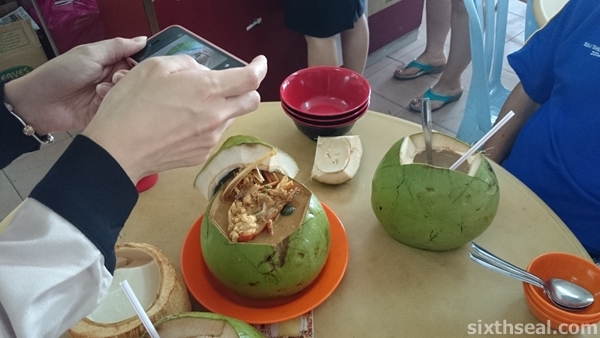 It’s not just served in a coconut shell, this new recipe uses coconut juice instead of water so it’s very sweet. They literally replace the water with coconut juice. Ok, now you got me going nuts… COCONUT! The prawns are pretty expensive but really gotta try it out first to justify. Yeah, the big head prawn is an expensive species coz it’s coveted locally in Sarawak. It’s a freshwater species called Macrobrachium rosenbergii – I took great pains to find out the actual scientific name coz I was puzzling over what it was for a long time and now I am certain coz I talked to a Department of Fisheries guy in Sarawak (even he had to refer to a study). I highly recommend trying the ones in the coconut, it uses coconut juice instead of water when they cook it and that makes the broth sweet. The coconut tom yam big prawn noodles is a recent recipe – they invented it late last year, using coconut juice in place of water when they cook so the soup is sweeter and tastes of coconut water. They still serve the older version (without using coconut juice) that’s served in a bowl though, I just wanted to try the new one coz I’ve eaten the old recipe a lot of times. Yeah, it’s really good eh? I think it’s the best big prawn noodles around Sibu (including Sarikei and Jakar). RM33 a bowl, not cheap, BUT I would try it if I have the chance, since it’s so popular there.. And wow, the shop owner actually noticed your blog, printed and pasted it in the shop? Terror la you, haha..The coconut pudding looks really really refreshing, I’m salivating over the pudding (and not the noodles, pffftt, haha)..
It’s a coveted species around here called “big head prawn” and it’s Macrobrachium rosenbergii – they use the biggest mature adults which has long “antenna” that ends with claws. coz it’s in a clear bowl while this is in a coconut. I prefer the new coconut recipe though coz it’s not just put in a coconut for decoration, they actually use the coconut juice from inside the coconut to replace water while cooking. Yeah, they asked me where I was from and why I was taking so many photos the first time I went (were really friendly and curious) so I told them about my blog and they actually went in and printed out the original review I wrote about them 6 years ago and pasted it on their stall. …but that was temporary for a dinner event. Haha! The coconut pudding is awesome, they promote it heavily and although it might sound expensive at RM 6, it’s really worth it coz they make it in-house (homemade) and there’s a lot inside the coconut. It’s very tasty too, almost every table ordered one due to the heavy upsell (they even have a large banner outside their shop). 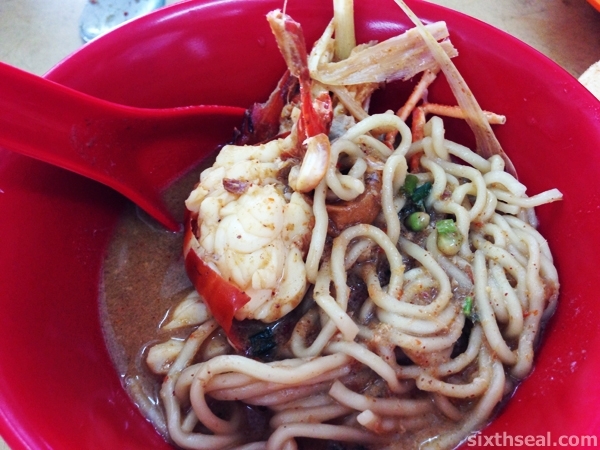 The big prawn noodles here is my favorite among all the places I’ve been to in and around Sibu. 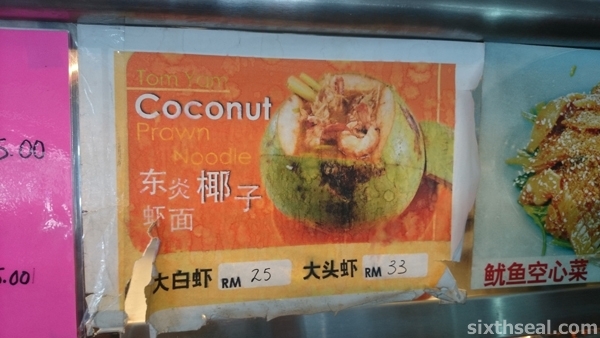 I think paying RM33 for the tom yam big prawn noodles in a coconut is really worth it. Sounds very delicious! …and I told her I thought it was langoustines but it’s not, I finally finished my mission to get the right name for it – Macrobrachium rosenbergii! This is a new recipe – last time they used a clear bowl and they just introduced the coconut tom yam big prawn noodles late last year. 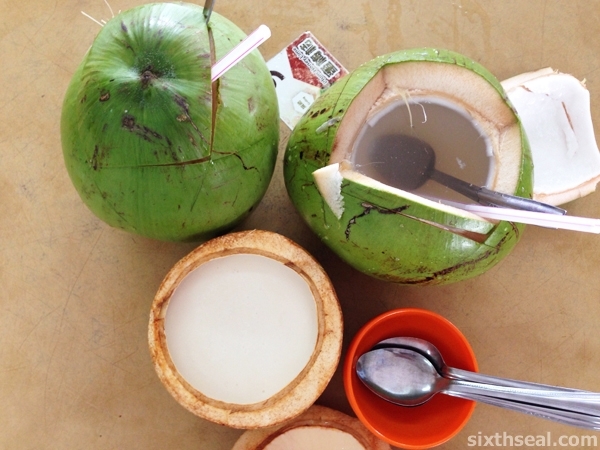 Yeah, it’s really delicious coz they don’t just use in an empty coconut for decoration, they actually use the *coconut juice* from INSIDE the coconut to REPLACE water while cooking and that makes all the difference. 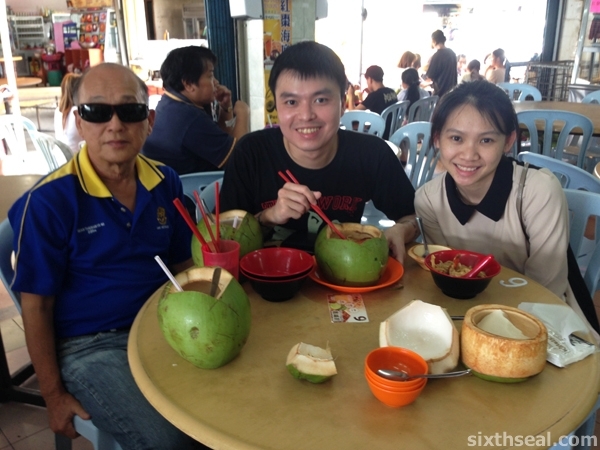 The original coconut prawns noodle is from Sarikei. I managed to taste one in Sibu at RM30. Must give the Sarikei one a try if I go on road trip next round. My hubby said it was good. He always go there once a month to visit his branch there. Well, I’ll love to try this even though it’s not the original. I want to see how it stacks up against the original in Glory Cafe in Sarikei. I told my better half that I’ll bring her to Sarikei when we were at Min Kwong RM 35 big prawn noodle (Foochow style) last year when she came so I took this chance to drive down with my dad too. Oh, I know, someone in Facebook also told me about this place! 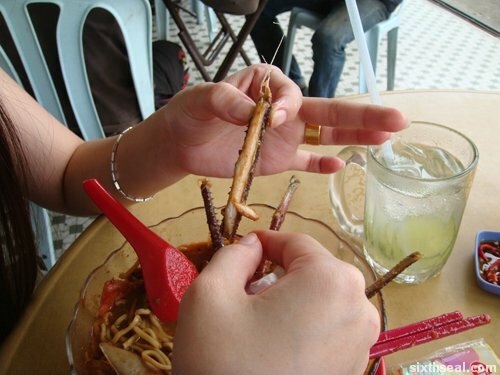 He said there’s a big prawn noodle in Lorong 31, Ding Lik Kwong! So this is the place he was talking about – same one you went to. Okay, I shall try it next time! Yup, I agree with your husband, the Glory Cafe version is very good! 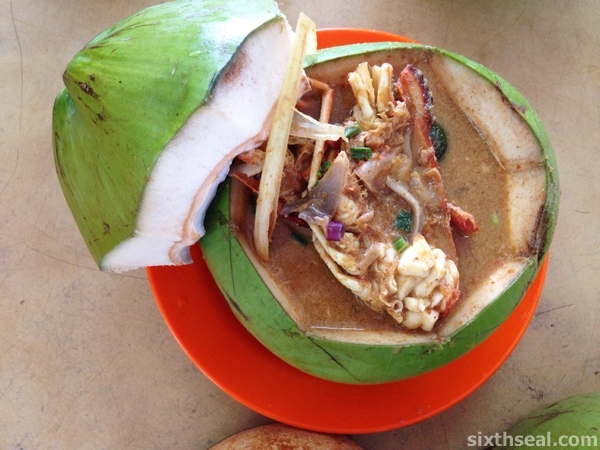 I’ve eaten it since 2008, first the original one (cooked with water and served in a bowl) and then this newer version which replaces the water with coconut juice so it’s sweeter. It’s currently my favorite one, but I’ll be sure to visit this place in Sibu too. Thanks Rose! Pingback: What you want… | ...Still crazy after all these years! Hi! Would you know the phone number of glory cafe? Thinking of visiting sarikei tomorrow. Thanks! !